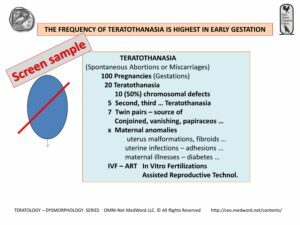 Webinar A – “Teratology Overview” by Prof. W. Wertelecki, M.D. (98 min) – includes videos “Dysmorphology Physical Examination of a Neonate with emphasis on Prenatal Developmental Markers” (part 1 of 3 by Prof. K. Jones, M.D.) and “Teratology Principles” (an extract of “Laws of Teratology” by Wilson-Warkany et al.). Supplement to Webinar A – “Congenital Malformations in Rivne Polissia and the Chornobyl Accident” by Prof. W. Wertelecki, M.D. (32 min). 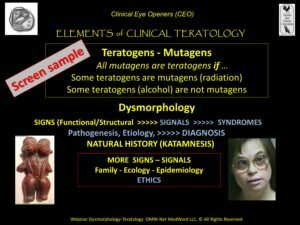 Webinar (B) – “Clinical Teratology” by Prof. W. Wertelecki, M.D. ( min). Supplement – “Intrauterine Vascular Disruption as a cause of Birth Defects” by Prof. K. L. Jones, M.D. (75 min).